Whew! We have made it through the holidays! The family and I are still out of town visiting family and I am certainly on FL time! 80 degree temps, the kids in the pool, and I forget that I have a blog to post on! lol! I hope you all enjoyed your holiday- I know we did! 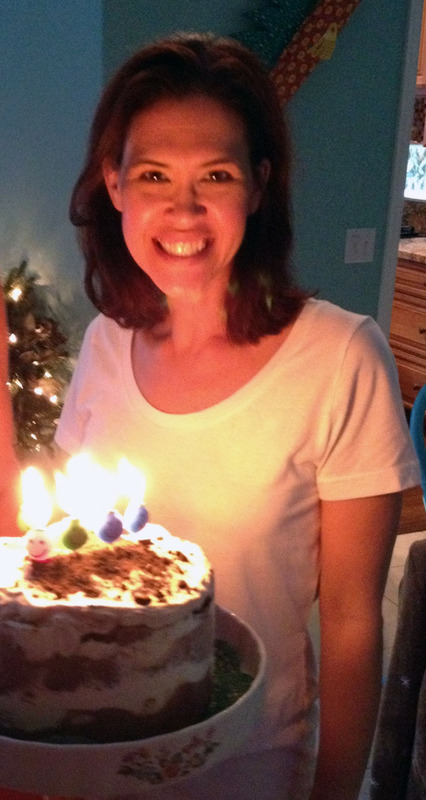 Plus, you add my birthday to the mix and it was great!! I know Christmas is over, but I do have some cards I made that I will share with you over the next few days. 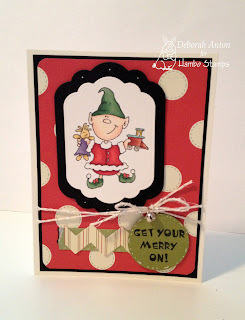 Today, it's time to Get Your Merry On!! Ending this post is a little picture of me when the family came out to give me my cake which was a yummy homemade ice cream Oreo crumble cake!! Delish!! Thanks for taking a peek and enjoy your day!! 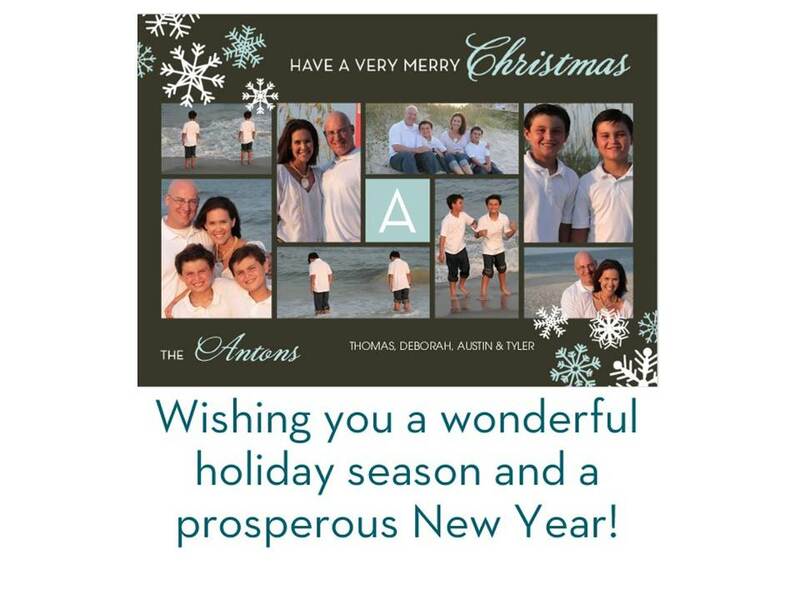 I'd like to wish you all a Merry Christmas from our family to yours!! Thank you for all your support this past year look forward to another fabulous year sharing my creations with you! 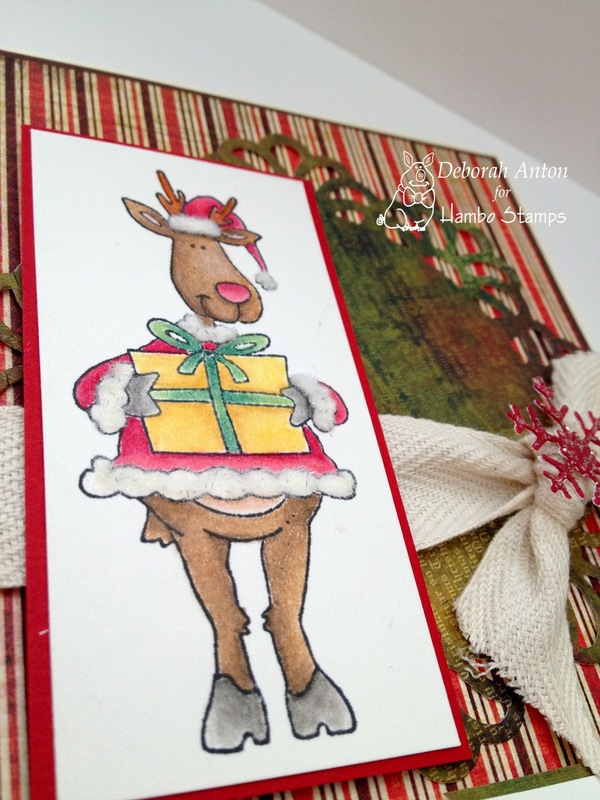 Just a super quick and easy Christmas card I put together to send to a friend. I really like how it turned out using some Studio G cheapies and a sentiment from SU! 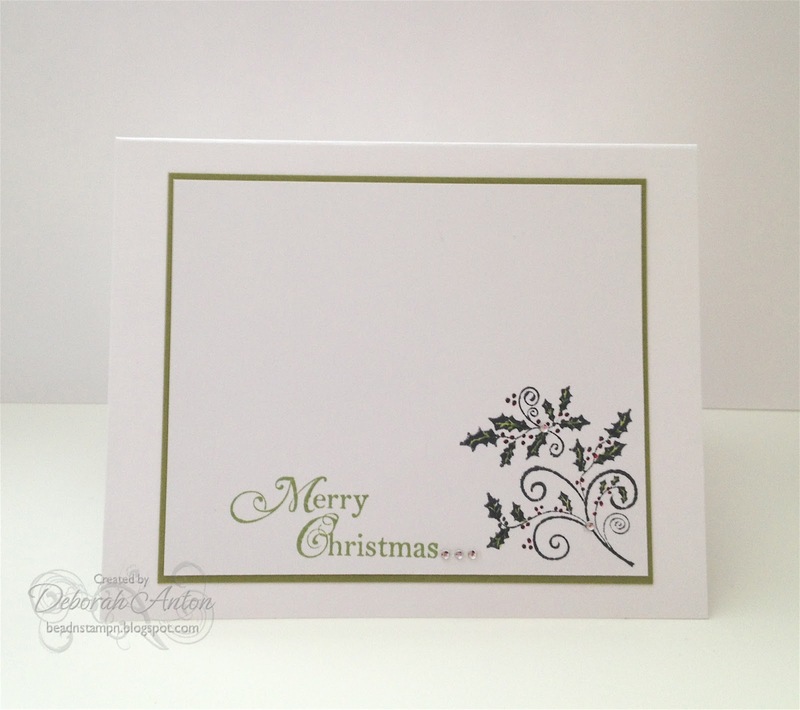 I finished the card by adding some crystal rhinestones after the sentiment and a few within the holly. Usually, these stamps don't stamp well, but this one did ok. I added a touch of Copics within the leaves and berries. I hope you all are getting caught up on your holiday preparations! I have finally gotten caught up enough to get back to crafting. It has been quiet here lately, I know, but I really had to get it together! lol! So... today is a Can You Digi It? Inspiration challenge of Not Even a Creature was Stirring... 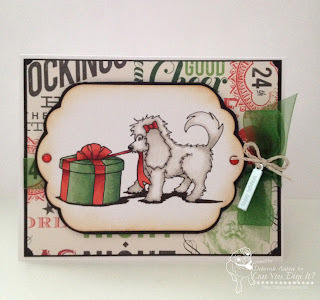 I used an image from KiniArt called gift opening dog- isn't he cute? For this, I used my Copics to color him in and the dp bg is from Paper Studio. I cut out the image with my Nesties and popped it up. I used some sheer ribbon and a metal stamped accent with some twine to finish it off. Do you like to digi scrapbook? Well, head over to CYDI? 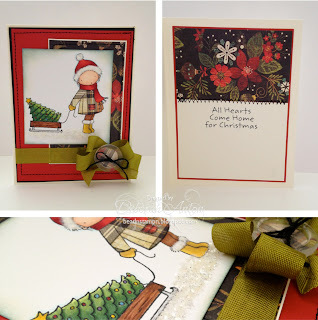 and download your 12 days of Christmas Freebies of monthly scrapbook layouts! One for each month of next year! Thanks so much for stopping by and taking a peek! I have to get inky today and get some deadlines there accomplished! :) Have a great day! 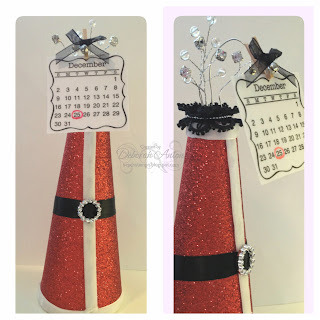 Here is a whimiscal calendar holder I made using a cone styrofoam and some muslin glitter sheets. I purchased these items in hope of creating something totally different, but somwhere in my makings, I went down this path of creating a calendar holder. The calendar is from SRM Stickers and it is attached by a mini clothespin, allowing for the changing of each year. 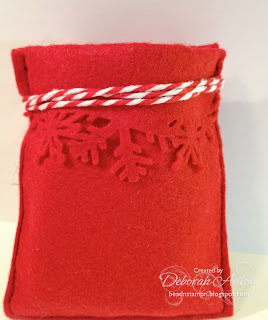 I covered the cone with the glitter sheet and then added the embellishments of white velvet ribbon and a rhinstone ribbon slide to look like a santa suit. I decorated the top with some rhinestone wire embellishments and lace ribbon. The clothespin is attached to a craft wire and the top and bottom of the cone is finished as well with the glitter paper. 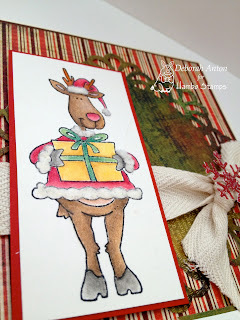 Makes for a fun calendar for the kids to keep an eye on Christmas!! Well, I am off to complete my Christmas cards! I. Must. Finish!! : ) Hope you all have a fantastic day! Well it's a rainy Monday here and getting cold. I can't believe it's the 10th already and I feel a bit overwhelmed getting the holiday necessities in order! But my husband has been working a training excercise at night, that he is sleeping in the day throwing my schedule off. Amazing how that can happen. lol! 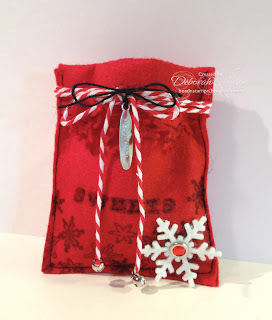 Today, I want to share with you a sweet treats bag I made from felt and adapted from Toshs' blog. You can find her tutorial here. 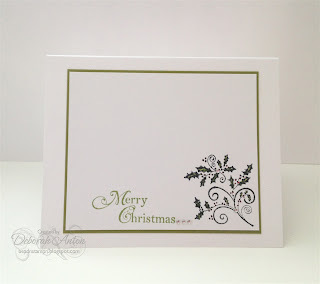 I used TCP's new topper dies for the fold down portion and the new Snow Kisses set for the stamped snowflakes. The sentiment 'Sweets' is stamped from the PTI set of spooky treats. Here is a better view from the back that shows the topper die cut better. 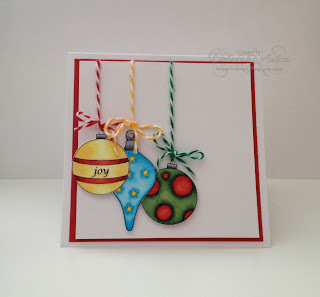 To finish it off, I used the MFT snowflake die with a rhinestone brad in the corner using some white felt. 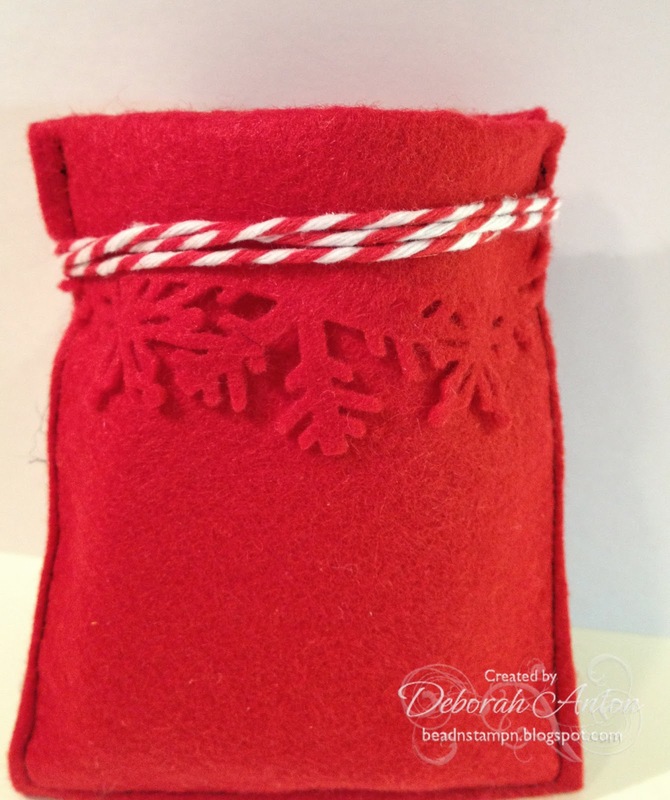 Then some red and white twine to wrap around the top with a metal tag that says 'Happy Holidays' and some mini bells to the ends of the twine. Super easy and fun!! Thank you for taking a peek and hope your day is dry and productive! : ) Have a great one! The images were colored in with Copics and cut out to be popped up. Finished with some twine from The Twinery! Easy peasy! Thanks for popping in and have a great day! 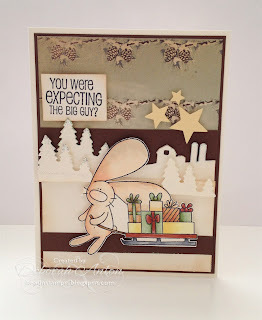 It's that time in the pig pen over at Hambo Stamps! It's changing of the guards with those of us who were working on the digi's these last 2 months are now working with the rubber collections. So to kick off the new term, I made a card with a great image and sentiment to boot for the holidays! Be sure to head over to the hoedown to check out the new group of digi girls to see what they have created for this weeks challenge!! I also wanted to quickly share with you a project I did this past weekend with some dollar store ornaments, a hanger, and a little hot glue. Makes for a super simple wreath that looks great! It was a perfect addition to a wall in our living room to complete the decorations! Thanks for stopping by and hope you all have a great day! Here is a card I made for MFT's SCS Sketch Challenge using an MFT Pure Innocence set. I colored in the image with Copics while sponging around the edges and then sewing using my sewing machine. I used some Our Craft Lounge Sparkly Fluff in white for the fuzzy items and some snow glass glitter for the ground. The inside is also finished with the sentiment and the bottom picture is a close up of the glitter. Thanks for stopping by and hope your day is stress free!! Have a great one! 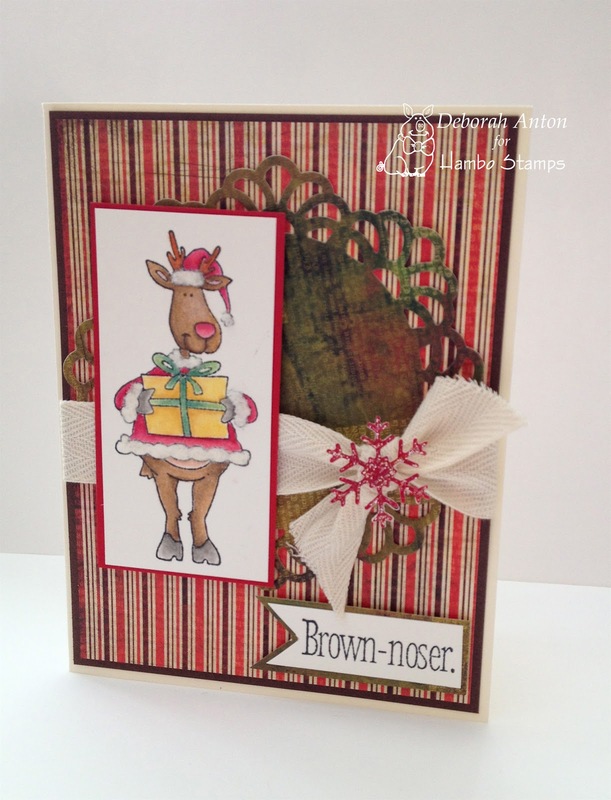 I also used the new Cut Up's Toppers which are are so much fun for creating backgrounds. I cut out additional trees for the scene and added some stickles for the snow tops. I colored in the image with Copics (and on the wrong cs might I add, so blending is sub par but I don't like to waste...) and popped him up. The stars are also from my topper set which I used for above the scene. DP is an oldie Cosmo Cricket collection of Winter Wonderland.